In 2001, ISOWA celebrated the 80th Anniversary of the founding of the company. Within the company during that time, the workforce was dominated by robot-like employees who thought things like, "I shouldn't say a word," "I should keep out of other people's work," and "I just have to put up with doing my job" and who did the work they were given in just the way they were told to do it, things that were the exact opposite of the principles for action set up by the company. Under those circumstances, on October 7th of that year, an 80th Anniversary Memorial Lecture was given that became a huge source of motivation in the reformation of our company after that. 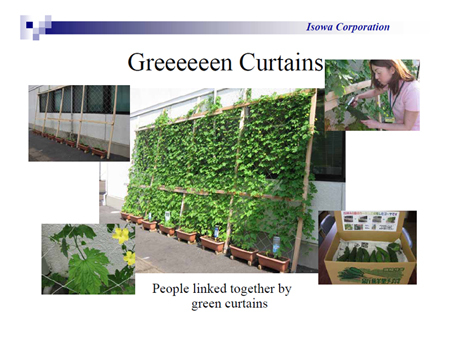 "Green curtains," made of plants, have been cooling off the hot summer for us here in the plant and office at ISOWA. This activity, too, which started quite spontaneously about two years ago, has spread so much, little by little, that it can now be seen all throughout ISOWA. Now, we've started becoming more involved in exchange with people from outside the plant by sending customers things we've picked up and getting things from customers, too. This not only helps to deepen the bonds between employees but also results in a deepening of the bonds between ISOWA and the people from outside the company.